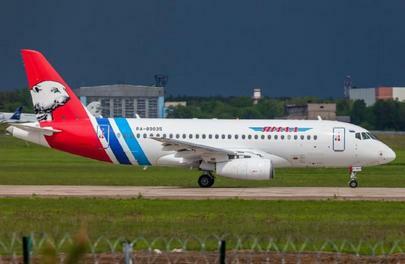 Yamal Air Transport Company (Yamal Airlines) has taken delivery of the second and third Sukhoi Superjet 100s. One of the aircraft, with tail number RA-89035 (s.n. 95067), arrived Yamal Airlines base airport in Salekhard on May 19, followed by the second one, tail number RA-89036 (s.n. 95070). Both aircraft were built in 2014, and are leased from the State Transport Leasing Company (GTLK). All three SSJ 100s in Yamal’s fleet are the long-range modification, equipped with 103 seats in single, economy class configuration. The aircraft were initially intended for UTair Eхpress, which has left the market. The very first SSJs that Yamal Airlines received has been flying for 50 days—its commercial operation started in the end of April. The second and the third aircraft are expected to start operating regular flights at eh end of May. A source in the airline told Russian Aviation Insider that the fourth aircraft may arrive late in June, and the fifth – in the autumn. The SSJ 100s were supposed to eventually replace three Boeing 737-400s and a 737-500, but those will not be phased out before mid-2017. The carrier had to extend the leasing agreements for the Boeings due to delays in receiving the SSJs. Originally Yamal was planning to replace its Boeings with the more spacious Bombardier CRJ900/1000, but state support measures persuaded the carrier to opt for the Russian-made SSJs. Yamal also operates seven A320s and two A321s, which will continue to be the core of the airline’s mainline fleet. Having SSJ helps the airline stay flexible in terms of capacities. On the Moscow – Krasnoyarsk route (3330 km), for instance, if it can’t fill the seats on an A320, SSJ 100 will fly with 95% load factor. The shortest routes for the SSJ in Yamal’s schedule are from Salekhard to Tyumen (1050 km) and Nadym (1000 km). Saving on ATC and airport fees, as well as “adequate” fuel consumption make the aircraft’s operation worthwhile, a source in the airline said. However, he complained that the after-sale support is inefficient and costly. When the two aircraft start commercial operations, Yamal is considering basing them in Krasnoyarsk. It will also start flying from Ufa and Yekaterinburg to regional destinations in Tyumen region and to the European part of Russia.